Dicks Sporting Goods in Williston VT will be hosting a second 20% off store wide weekend on April 6th & 7th! This is a great way to get gear now that you’ve got a new practices under your belt! Maybe you need a new mouthguard, water bottle or some mesh? 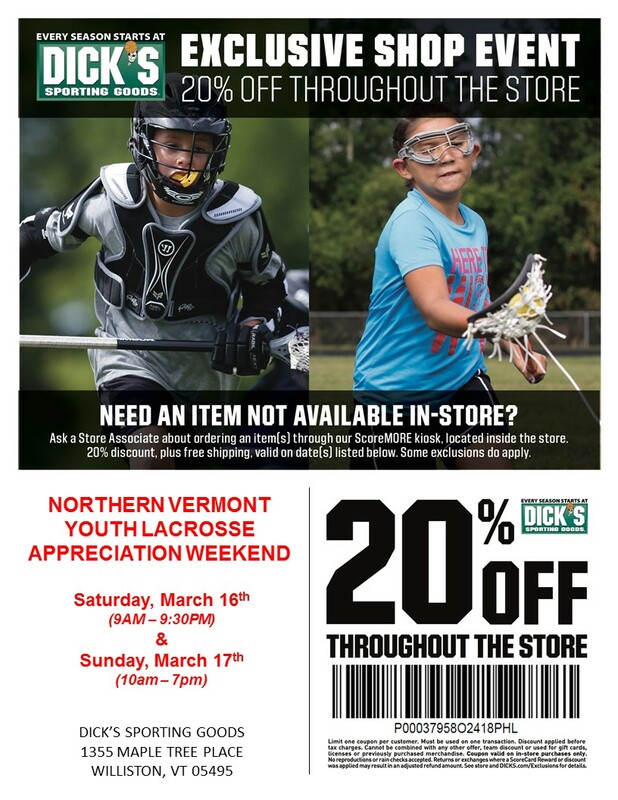 Thank you Dicks Sporting Goods for your ongoing support of NVTYLL and the growth of lacrosse in Vermont. Below are the coupon details. This Is a 20% off store wide coupon so families can come into the store and get their needs for the season as well as any other needs they might have. The 20% will come off the entire order at the register when the coupon is scanned. We will also have a 20% off online coupon code in store for the products out of stock.